Do You Know How to Seal Your Interlock? - Legends Landscape Supply Inc.
Fall means shorter days and colder temperatures. And with winter soon approaching, it's the perfect time to think about getting your outdoor landscaping ready to handle the cold weather. A big part of your outdoor space is your interlocking pavers. 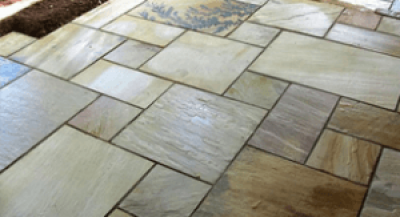 Even though they’re made from tough natural stone, they’re still susceptible to staining or discolouration due the snow and ice that will eventually fall. By sealing your interlock driveway, you’ll make certain it keeps its colour and looks its best all winter long. And with the right tools and know-how, you’ll be able to seal your interlock driveway or interlocking patio stones like a pro. Make certain you move any patio or outdoor furniture off of your interlock pavers before you wash them down. When you do hose them down, be sure to do a complete and thorough job. Create a solution that’s very sudsy and soapy. Then, let the solution sit for approximately 20 minutes. Once 20 minutes have passed, scrub the solution deeply into the pavers using your scrubbing brush or broom with stiff bristles. Even after you’ve cleaned them with your brush and solution, there may be some stains which are still visible. If you find any stubborn stains, clean them with the brick or concrete stain remover. Just be sure to follow the instructions carefully. Remember, the sand should reach about halfway up the side of each individual paver stone. When done, sweep away any leftover sand, soil or other debris with your broom. Use long, smooth and consistent strokes. You can then use the paint sprayer to spray the sealant on the pavers (especially if you have a large area to seal). Don’t forget to even spread out any excess sealant over your interlocking pavers. For brand new jobs, you may want to wait for the interlock to weather for approximately 60-90 days. That way, the efflorescence will come out (and not be trapped under the sealant, giving your interlock that milky, hazy appearance). Once the sealant has dried (as per the time recommended on the label), add another layer of sealant. You worked hard this year to install attractive interlocking pavers on your property. Don’t risk your hard work by neglecting to seal and protect them for the upcoming winter weather. Contact us with any questions about your interlocking pavers. We’ll be happy to provide a FREE quote, or to give you the advice you need to keep your interlock stone looking its best for years to come.